The King Khan & BBQ show tour was sorely interrupted on November 12th when their rental car was “randomly” stopped at a “safety checkpoint” in Kentucky. All were arrested and the groups manager was jailed on possession charges (mushrooms). Two shows were missed. People expecting a Shrine’s style stage full of musicians and dancers may have been initially disappointed to find only the dynamic duo (King and Sultan), but any disappointment would be quickly flattened as the two tore threw a long sweaty set and encore. No distractions, just King and Sultan, giving it all their mighty powers. Mark Sultan used all 8 appendages, playing fierce guitar while keeping the pounding, tribal beats on drums and tambourine with his 2 feet. It seems his foot went through the tambourine which was attached to one of the two drum pedals. King Kahn dressed elegantly in a sleeveless, shimmery blue dress. The fringed skirt barely covered his thighs. He wore a black helmet with a silver spike and eagle on top (Franco-Prussian war perhaps? ), snappy red tennis shoes, and a necklace of teeth and bone. Together they plowed through most of the KK&BBQ catalog including great renditions of personal faves “Zombies” and “Why don’t you lie?”. Yes there was moshing. Opening act, Those Darlins come from Murfreesboro, TN. They have developed quite a reputation for wild shows with lots of drinking and mayhem. Consisting of 3 lovely ladies (Jessi Darlin, Kelley Darlin and Nikki Darlin on guitar, bass and ukulele) as well as a handsome dude on the drums. He has not achieved the “Darlin” surname yet. The show defied all expectations. Shredding guitar and lots of stage antics. Nikki, in particular, was in prime form. She jumped into the audience to have a cigarette and push some guys around. She climbed back on stage only to drool beer into the welcoming mouth of a lucky young man in the front row. Yet with all the drinking and rocking they still found the time to answer some questions for us at the OCMD! Smart, wonderful, sober answers, enjoy!! OCMD: How is the tour so far? Any favorite cities or venues? Will we see you at SXSW this year? TD: Interrupted. The Bottletree in Birmingham is one of the best venues, for bands especially!!! They have 2 air stream trailers outside that are fully equipped with flat screen tvs, dvd players, refrigerators, blankets, beds, movies , nintendos, etc. They are all decorated really retro and awesome, they even have lawn gnomes and an outside hangout out area with lawn chairs. The bands can stay there all night if they want! and there is still a huge back stage area with tons of couches and comfy stuff, including massage chairs!! It rules. As far as cities on this run, atlanta, st louis, and memphis brought it as a whole. But there have been crazy sweet people in every city. Los Angeles showed up with huge enthusiasm after the Troub cancellation and a last minute venue change. Yes we shall be back to the SXSW festival this year. At least we sure hope to be. OCMD: How are things going with the King? It seems like a match made in heaven. Are you playing any songs together yet? Is he behaving himself since his arrest?? TD: Things were great with King Khan, until they went missing. We were pretty damned worried when no one could get a hold of them. And then their whole run in with the KY sobriety force. A drag on everyone. We’ve had to cancel 2 shows and move one. But we’ve tried to keep the spirit of the tour going…we played extra long sets and covered some KKBBQ for Kansas fans who were understandably bummed. And now we are on our way to rejoin them in SF. I think it is a match made in heaven. And, Khan and I can share accessories. The rest of the tour is gonna be crazy fun. I think everyone has a lot of pent up energy to play out. I don’t know if he is behaving himself since then, as we haven’t seen him yet. But i would hope he isn’t. OCMD: Tav Falco Pather Burns. Great American rockstar or the greatest? Can you help spread the gospel about Tav? Maybe a cover? We would really like to see him return home from Europe and we need your help! TD: We love Tav Falco! Yeah, we’ve wanted to tour with him but he’s so far away…we can certainly help with a campaign to let him know how much he is loved and missed in the States. We’ll start with a cover and then try to court him with love letters. Surely there are others who will join us in our efforts? And if he doesn’t come here, we will just have to go to Europe and find him! 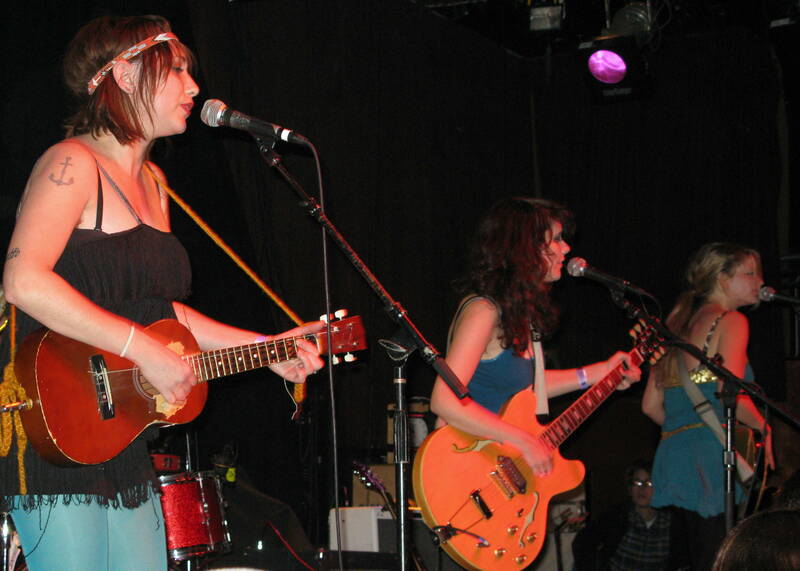 OCMD: Why should we love you more than the Vivian Girls? TD: When it comes to love, you should follow your heart…I love the Vivian Girls’ use of reverb, but I will say that we can shred some guitar solos. OCMD: What do you look for in a groupie? TD: I look for groupies that will carry my equipment, buy me drinks, and never talk to me. OCMD: Top 5 things to do in Murfreesboro?? ..other than say it over and over again? TD: Aww…they can become “rock stars” by being encouraged to be confident and creative. By rock stars, I mean that they will have the confidence to succeed in whatever they pursue. There are so many girls rock camps that have this very purpose as their main mission all over the US and around the world! Last I checked, there were over 20 camps and more being started all of the time. There’s a list of all of the camps maintained by the Girls Rock Camp Alliance, a group formed to share resources among camps. In fact, there’s a Bay Area Girls Rock Camp in San Francisco and there’s a full list available at <http://www.girlsrockcamp.org/supporters/grca>. We’re really proud to be a part of this kind of social change. Please check out the camps and help support the movement! OCMD: Thanks ladies! Safe travels and come back soon! 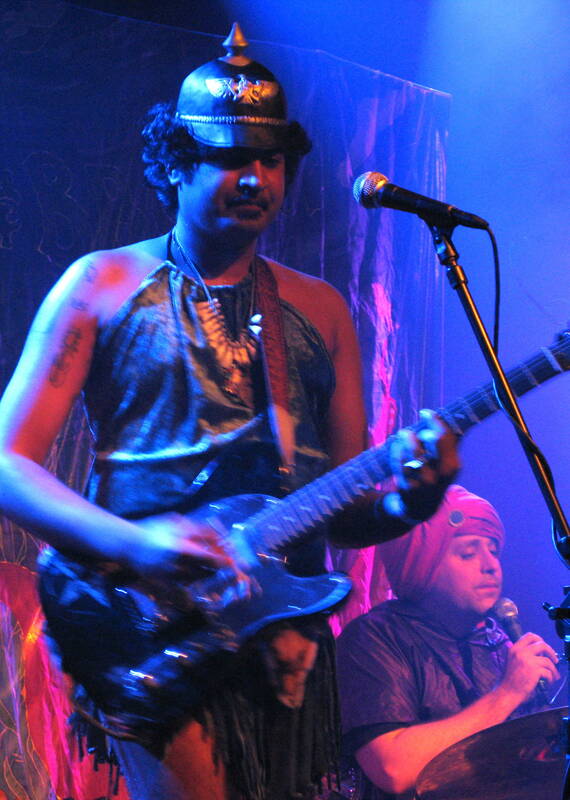 Pitchfork reported today that The King Khan & BBQ Show (not to be confused with King Khan & The Shrines) have been arrested while in Kentucky, causing them to cancel some Mid-West shows. The band is out on bail but their tour manager is still behind bars for driving with a suspended license and in possession of controlled substances. Whoopsy. The band is scheduled to play The Independent in San Francisco this Wednesday, November 18 with Those Darlins’. Let’s hope they get back on track for their West Coast appearances. The band is touring in support of their new album, Invisible Girl.